FCC's New Web Rules Trigger Washington Fog Machine : It's All Politics Anyone looking for clarity on what the FCC's new Web rules mean will be hard-pressed to find it. President Obama said they would keep innovation alive on the Internet while John Boehner said they will kill it. Federal Communications Commission commissioners listen to staff recommendations. Many people who use the Internet and are aware that the Federal Communications Commission just made an important decision involving the Web are wondering: What the heck happened Tuesday? The statements from President Obama and House Speaker-in-waiting Rep. John Boehner (R-Ohio) don't provide much help. They seem to be describing two alternate universes, one where the primary color is blue, the other red. Today’s decision will help preserve the free and open nature of the Internet while encouraging innovation, protecting consumer choice, and defending free speech. Throughout this process, parties on all sides of this issue – from consumer groups to technology companies to broadband providers – came together to make their voices heard. This decision is an important component of our overall strategy to advance American innovation, economic growth, and job creation. As a candidate for President, I pledged to preserve the freedom and openness that have allowed the Internet to become a transformative and powerful platform for speech and expression. That’s a pledge I’ll continue to keep as President. As technology and the market continue to evolve at a rapid pace, my Administration will remain vigilant and see to it that innovation is allowed to flourish, that consumers are protected from abuse, and that the democratic spirit of the Internet remains intact. As I said, more heat than light comes from those two statements. Put another way, the Washington fog machine was going full tilt Tuesday. Mercifully taking the consumer angle, NPR's Robert Siegel, All Things Considered co-host, asked Maguerite Reardon, a reporter for cnet.com if anything we'll see on the Web in a few years will be different because of Tuesday's FCC vote. It won't change what we're seeing but it will hopefully protect what we're seeing. So for example today you're able to stream Netflix on your computer or on your TV via the Internet. Now that these rules are in place it will protect (she meant "prevent") Comcast or Verizon from trying to slow down that traffic because they want you to be watching their own television service. So, in that sense, it adds protection for consumers. Cnet carries her very detailed report on the FCC decision. ROSE: The FCC’s last attempt to enforce net neutrality principles did not go well. In 2007, the commission tried to punish the giant cable and broadband provider Comcast for secretly slowing some traffic on its networks. 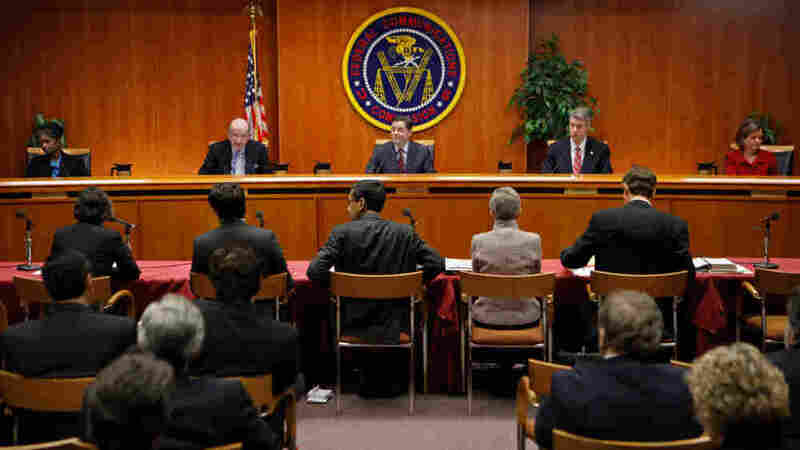 But a federal appeals rejected that ruling earlier this year, sending the FCC back to the drawing board. This time, the commission’s chairman tried to craft compromise rules that could attract support from big phone and cable companies, and technology companies that depend on unfettered access to consumers. STEVE WOZNIAK, APPLE CO-FOUNDER: I don’t think the rules went far enough in protecting individuals. But I tend to be on the side of the small guy. I feel emotional about that. ROSE: Steve Wozniak is the co-founder of Apple. He seemed to speak for many in the tech community when he said the new rules won’t do enough to protect start-ups and innovators from anti-competitive behavior by phone and cable companies. WOZNIAK: A lot times when the abuse occurs, you don’t see it. You can’t see it. Companies can’t start. They can’t get an edge. ROSE: The big phone and cable companies did get some of what they wanted out of the rules – especially AT&T, which pushed hard to make sure that wireless companies have flexibility to manage traffic on their networks. Public interest groups worry that will leave wireless consumers with fewer protections. The relatively lighter regulatory hand that wireless providers will have compared with their wireline counterparts is one important difference that comes out of the FCC decision. The FCC was evidently persuaded that there's much more competition and innovation in wireless broadband than the wired variety. Thus it required less regulation in order to keep it consumer-friendly.